The Optical Drive Connector (ODC) on the Mac Pro is often overlooked, because it’s sort of hidden. The Mac Pro 3,1 / early 2008 has two SATA II connectors on the mother board. They are intended to use with upgrades in the optical drive bay in the ‘top floor’ of the Mac Pro. For example, I’ve been using it as a Blu-Ray burner for years. Since I already used up the four HDD bays, I used one of the optical drive connectors to add a SSD, without having to sacrifice a regular hard drive. 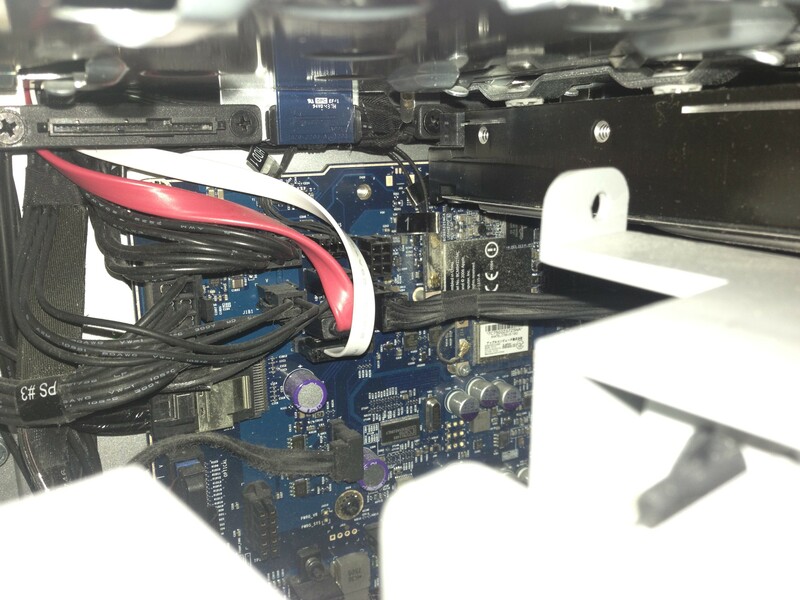 There is also a double molex connector in the optical drive bay that you can use to power the SSD. You’ll only have to buy a cheap connector. However, they are also very suitable for connecting one or two SSD drives. The ODC is a SATA II connector, that is even faster than the ‘regular’ hard drive bay connectors. If you use the ODC connectors and want to enable TRIM for optimal SSD usage, you’ll have to install a little piece of software. That’s a one-time exercise though. The picture is taken from the position of the left hard disk drive bay. I pulled out the hard drive so you can have a good view on the ODC’s. The optical drive connectors are placed in the center of the photo, just left of the black fan cable. The flat SATA 2 cables that are connected to them, in red and white, are clearly visible. First, make sure the machine is shut down and unplugged from the wall socket. To reach the ODC connectors, you’ll have to unscrew one screw in the top of the gray plastic fan mount and one on the bottom. Make sure you don’t drop them in the machine. Then you can easily slide de fan bracket out. There’s an thin, aluminum cap next to it on the right that you’ll have to loosen a bit too. That is held by small magnets so you won’t have to unscrew anything. As you can clearly see in the photo, there is a hole where the screw used to sit. It’s also a lot easier to get the cable from the top compartment when you first pull out hard drive number one. If you order a SATA II cable, make sure it’s a flat and flexible one. I used one with a safety head but the safety part doesn’t click or anything so don’t worry if your cable has that or not, they’ll fit either way.